Last Tuesday Darren and I went to the Barbican Theatre to see the English National Ballet perform Lest We Forget commemorating the centenary of the First World War. Using contemporary choreographers and performing three new pieces (and one revival) this was not the ENB we were used to. This was a bare-footed ENB, a future-looking ENB, an exciting ENB - bravo say I.
Liam Scarlett’s No Man’s Land: The Ballet boy showed us women working in a munitions factory and the men at the front who did not all return. Very moving. Russell Maliphant’s Second Breath: A beautiful dream-like piece. 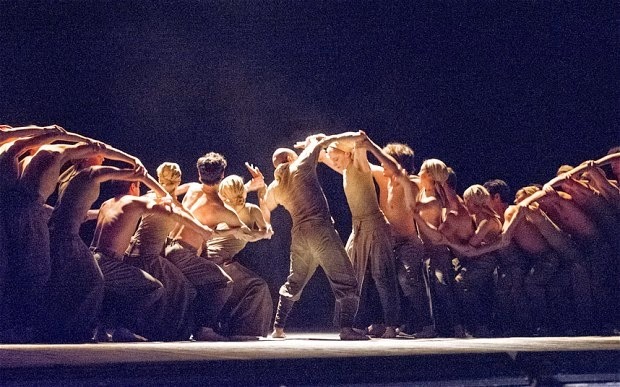 Akram Khan's Dust: A sensational, visceral piece that had the wow factor as Khan gyrated and convulsed about the stage and the company pulsated along with him.